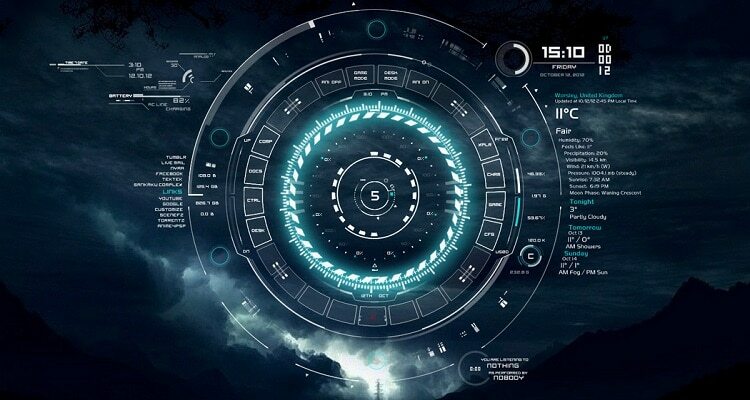 Rainmeter is an open source system monitoring program for Windows. 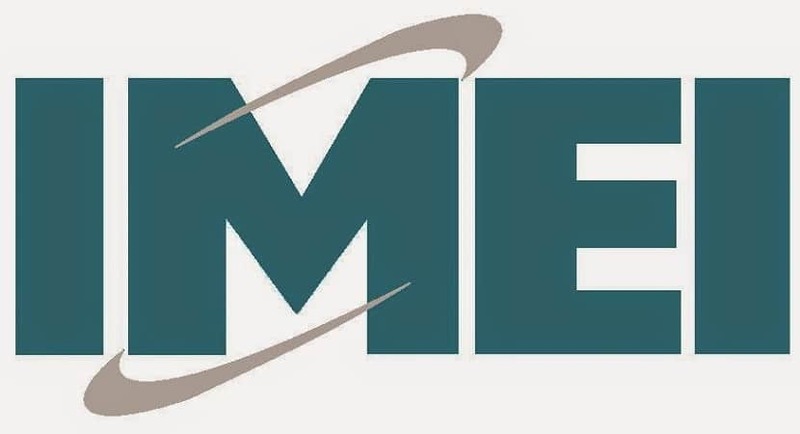 It was a software that was first developed for the Windows XP. 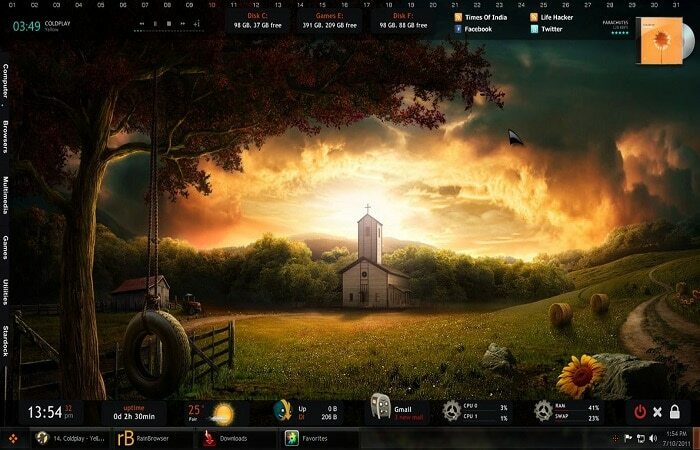 To customize your desktop using the many Rainmeter skins available. What started off as a way to display various info on the desktop. 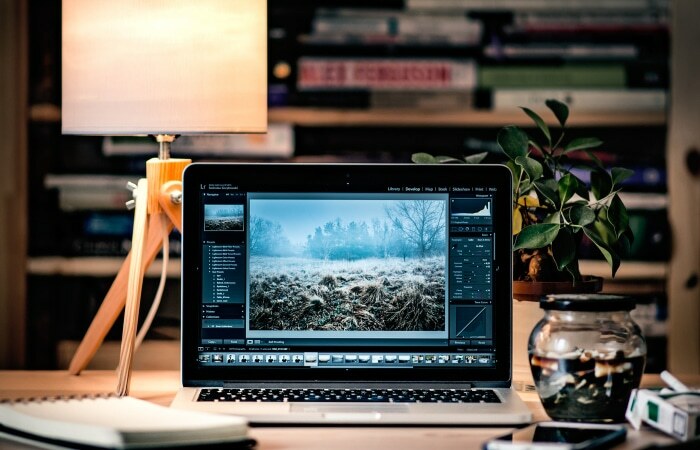 Has since become one of the best ways to make your desktop the coolest. 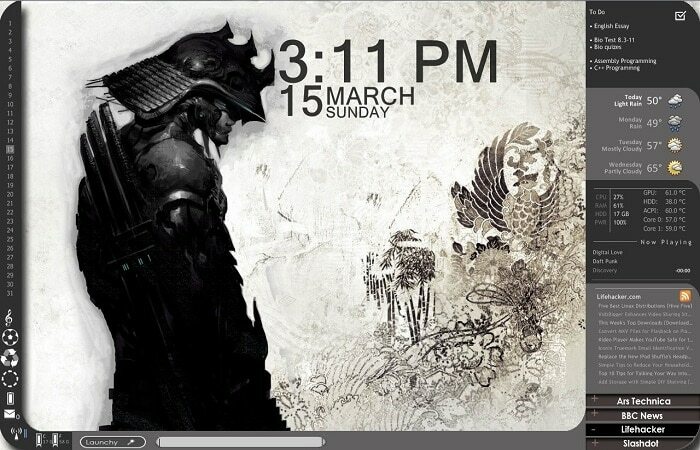 And the best part of RainMeter is that both the software and its skins are free for rainmeter download and use. 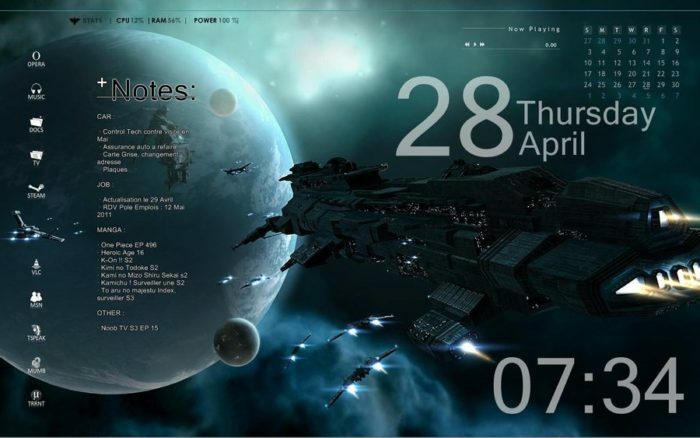 RainMeter themes are the visual tools that help your desktop display various information. 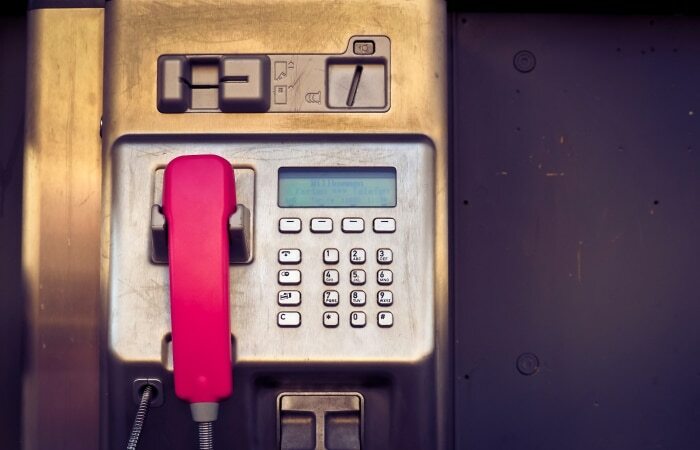 It can be as simple as single-purpose tools to a complex multi-purpose application. Multiple skins on the same desktop interact with each other using commands called ‘Bangs.’ The best part of RainMeter is that it is for everyone. 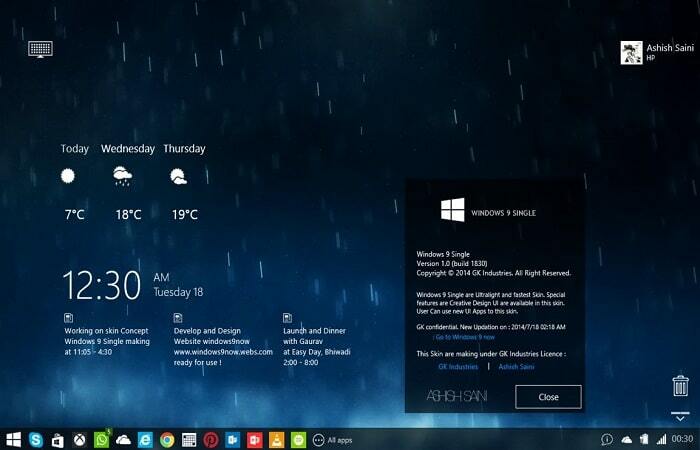 The Windows 10 update has vastly improved both features and visual aesthetics of the Windows. But, there is only one default interface. And users can change the visuals by changing the background image. Which makes the visuals experience of the new Windows a bit boring after some time. 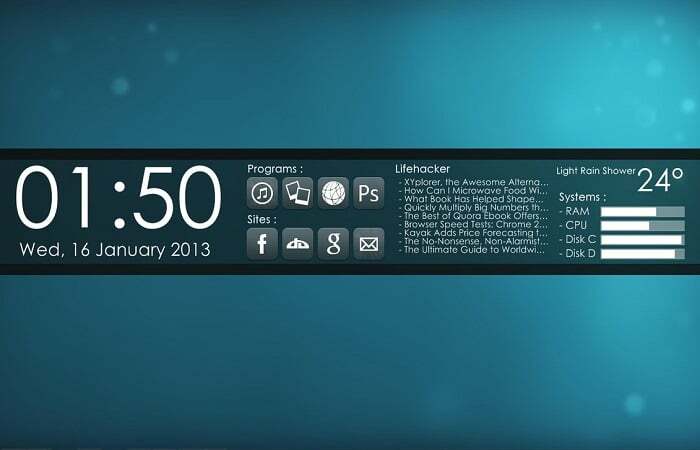 But like the older versions of Windows, here also RainMeter allows users to ramp up the display. This is by using and customizing their skins. With the huge developer community of RainMeter rolling out new skins frequently. It can get confusing and also literally impossible for users to go through the whole array of skins to choose the best one. That’s why, in this article, we have put together the best RainMeter Skins of 2018 that are available for Windows. A simple, but supremely robust and highly functional skin. The Windows logo is featured in the background of the Tech-A Skin which also has displays for CPU functions, Date and time and a myriad of other shortcuts that makes this skin not only look futuristic and good but extremely useful too. 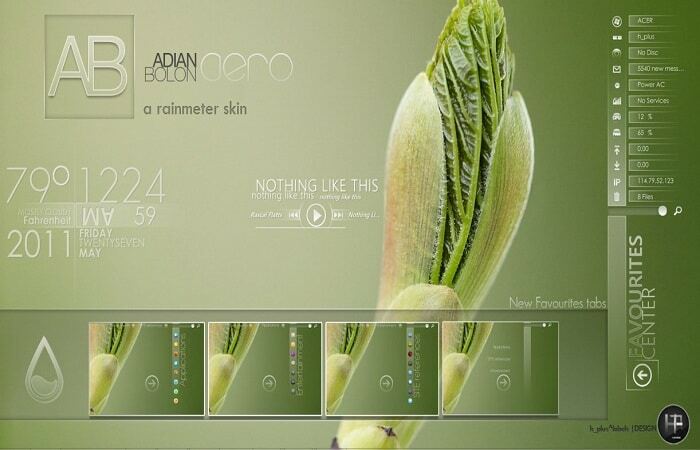 This skin also has a YouTube video installation guide, that helps new users to install the skin seamlessly. 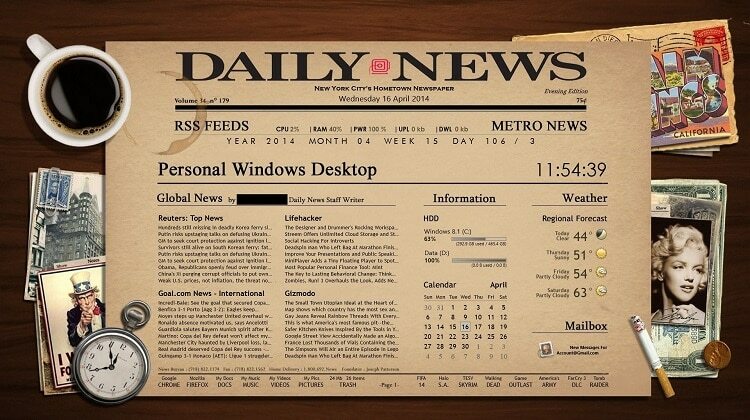 High on the old-school vibe, Newspaper Rainmeter skin displays a variety of information on the desktop all of which is arranged wonderfully to make it visually very pleasing. 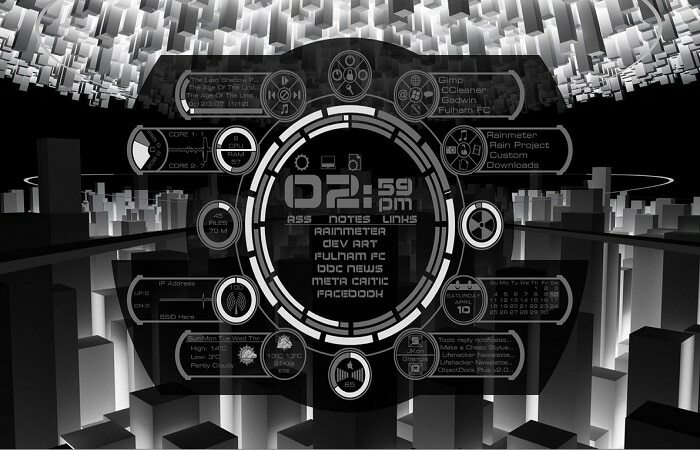 This rainmeter deviantart skin has 14 desktop launchers, a mailbox skin (for Gmail users only), weather skin, a notepad pop-up and systems stats pop-up along with a working pocket watch and a cigarette that burns all displayed on your desktop when you use this skin. 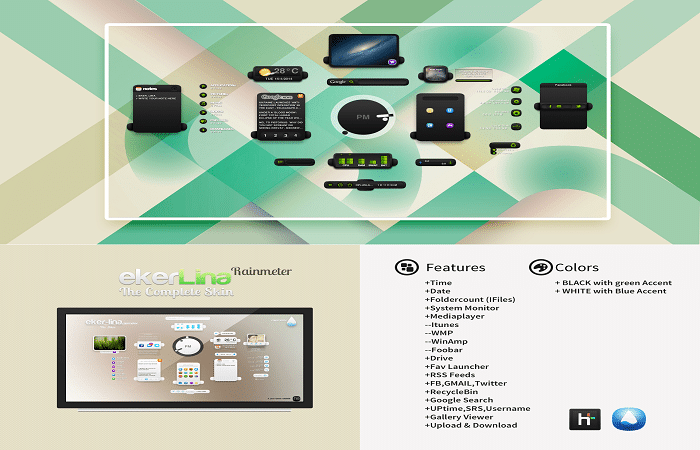 If simple things are what you like, then you will love Eker_Lina skin that is very simple and clutter-free yet has a lot of functions to display. Using this skin, you can display things like- Time and Date, Folder count, WinAmp, iTunes, Upload & Download, Drive, FAV launcher, RSS Feeds, Facebook, Twitter, Google Search, Gmail to name a few. The black color of the widgets displayed look nice when combined with a light color background image. Moreover, you can also change the widget color and combinations to suit your preferences better. This skin is modeled after the immensely popular first-person shooter game. 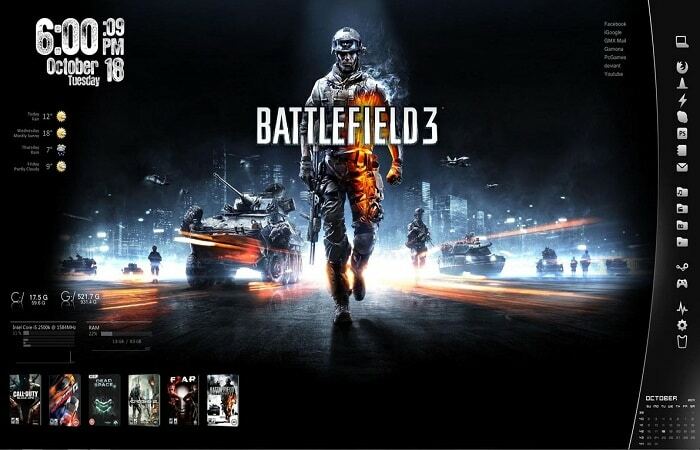 The Battlefield 3 theme is very popular with gamer not only for the visuals but because of its functionality that allows customization to make the desktop feel and behave like a gaming console. Along with the usual Weather, Data and time display you get a fully customization sidebar where you can put your favorite applications, shortcuts, and tools. 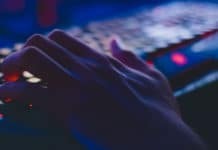 As the name suggests, Windows 2019 skin aims to showcase how Windows will look in the future year of 2019. The awesome visuals, square-shaped aesthetic widgets, and side information bar make this skin an excellent one for the users. The information bar is highly customization like the other widgets. 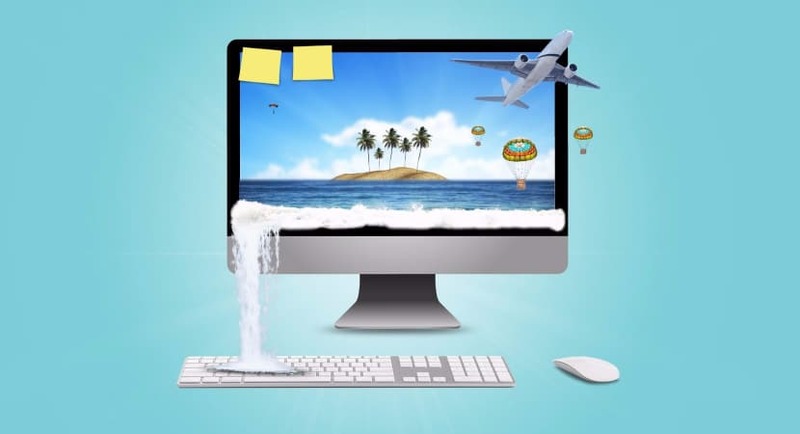 icons and applications on the desktop. Owing to its good looks and great features this skin is one of the most popular themes of 2018. 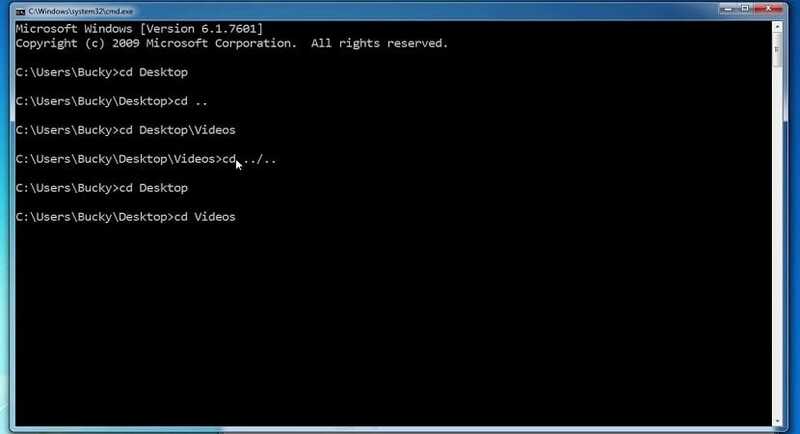 Before Dawn is probably one of the smallest and simplest skins on the list with a size of just 29.5 KB. This deviantart rainmeter skin is also probably one of the easiest skins to run as the installation is fairly simple without any major tweaking. 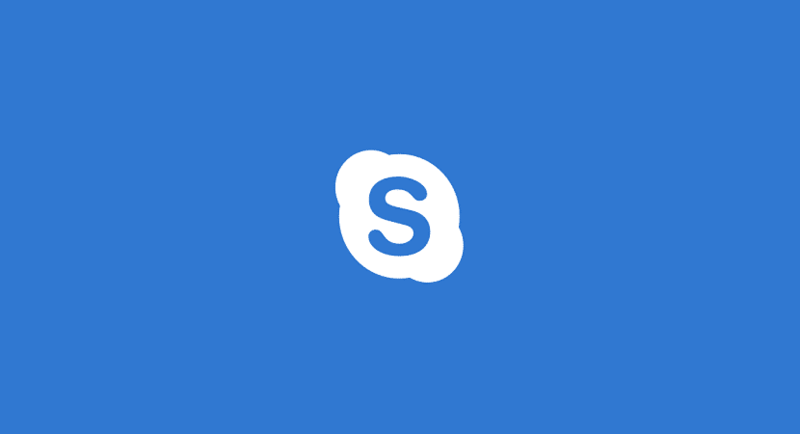 The information provided by the skin is displayed in an organized manner in the central display bar with icon links for your favorite websites and applications and also RSS feed. The Jarvis Rainmeter skin has always been a prevalent skin even in Windows 7 and 8. 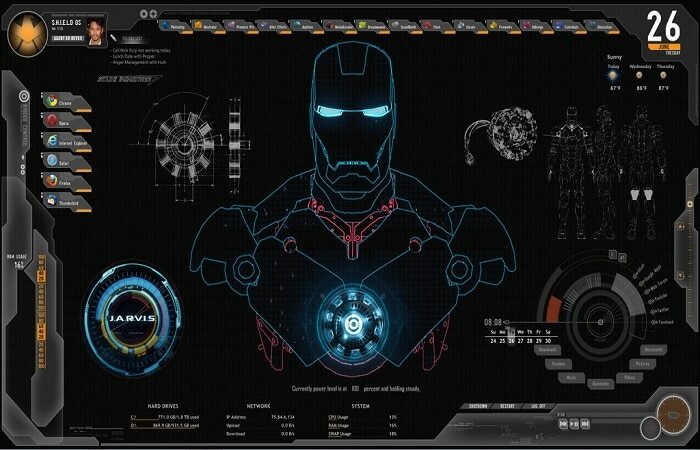 Among the many Iron-Man themed cool Rainmeter skins, this is one of the most stylish and makes your desktop looks like Iron-Man’s computer- Jarvis. 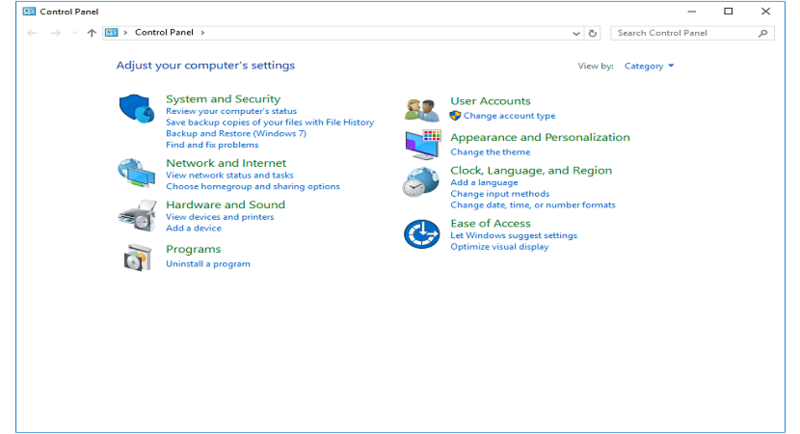 This skin includes basic system monitoring information, Weather, Time and Date along with email and other application shortcuts. Designed for the TV or Anime character fans, Senja Suite theme can display your favorite characters on the desktop in a slideshow of images. The skin also provides the usual contemporary skin features like Date and Time, media information, and power control buttons, thus making the skin not only a visual treat but functionally very usable. This minimalist skin is really soothing for the eyes, with its frosted glass transparent appearance and muted backgrounds with very little effects. Speed skin is derived from the fact that the CPU and RAM function display looks like a Speedometer. Darkness Falls as the name suggest is an amazing theme. If you like dark themed things, then this is definitely the skin for you. Also, it features things like widgets, displays and even the wallpaper comes in the dark mode. An added advantage of Darkness Falls is that you need very little customization to start hence making it easier for the users to being with. The name of the skin is given because of the Razor effect given to the background display by the sharp and glossy effect. 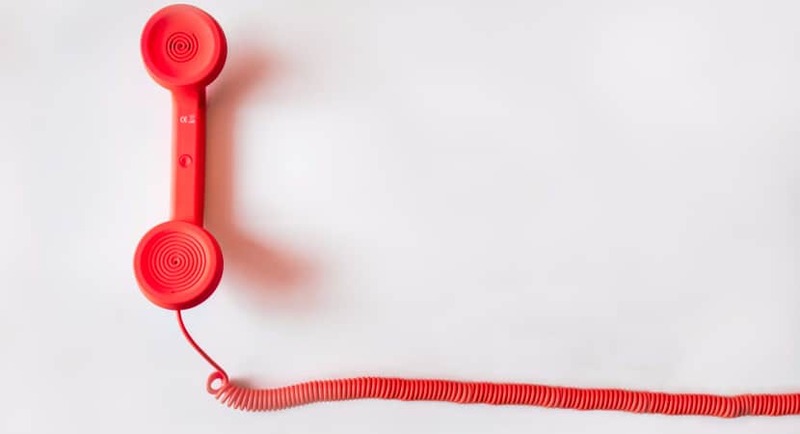 The visuals of this skin is entirely dependent on the type of background you use with it which can be anything from simple colored backgrounds to dramatic pictures. 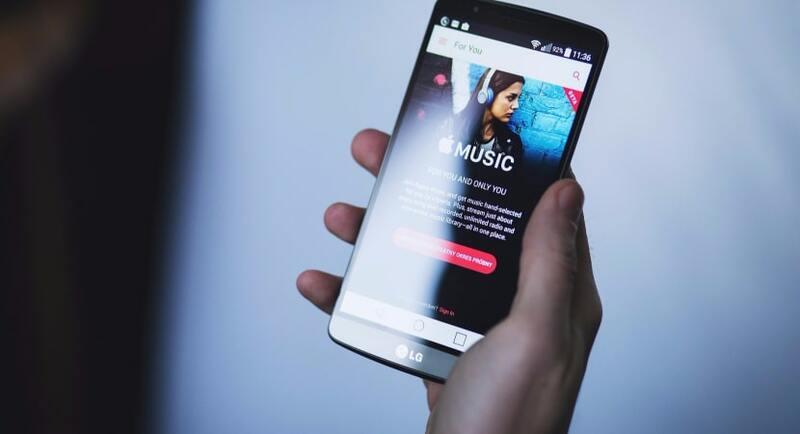 Otherwise in terms of functionality the skin provides all the usual features like Clock, shortcuts, weather, power and customization docks. 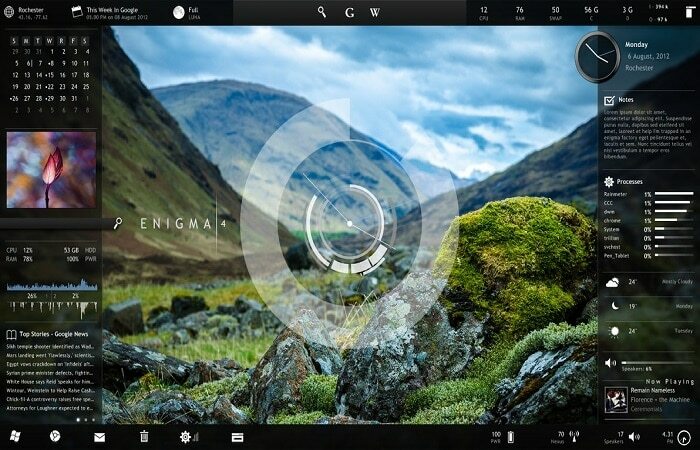 Enigma has been rated as one of the most downloaded RainMeter skins. Such was its popularity in 2009, that RainMeter made this its default skin that year. The all-new version is available for Windows 10 in 2018. The best part of this skin is the way the content can be displayed which makes it look really awesome. One of the best simple and minimalist RainMeter skins available for Windows in 2017 is this Single Mark 4. The visuals of this skin is based on the normal Windows visual concept but the gadgets and the layout makes it look really good. If you are looking for a simple skin, with minimal objects and customization requirement then you should definitely try out this skin. Neon Space is for all the fancy glory futuristic loving users who want their desktop to look like a computer from the Sci-Fi movies. Although very fancy looking, the dark colors paired with the neon glowing colors make for a very soothing display. Along with all the normal features and widgets (Date and time, CPU usage, RSS feed, etc) there is a bunch of fake displays too which adds to the complex futuristic feel. Pog Pack is based on a central cluster type analog-digital display which has all the information needed. This skin has 10 variables all of which are highly customization. 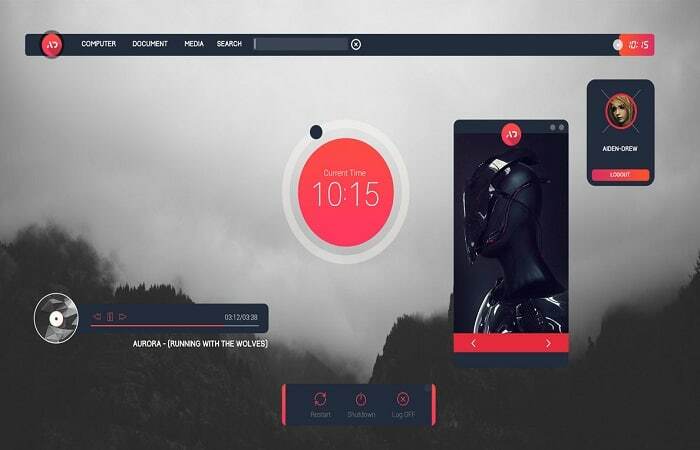 ABP is another elegant RainMeter theme based on aesthetic designing and simple visuals to give the users an awesome visual and functional experience. 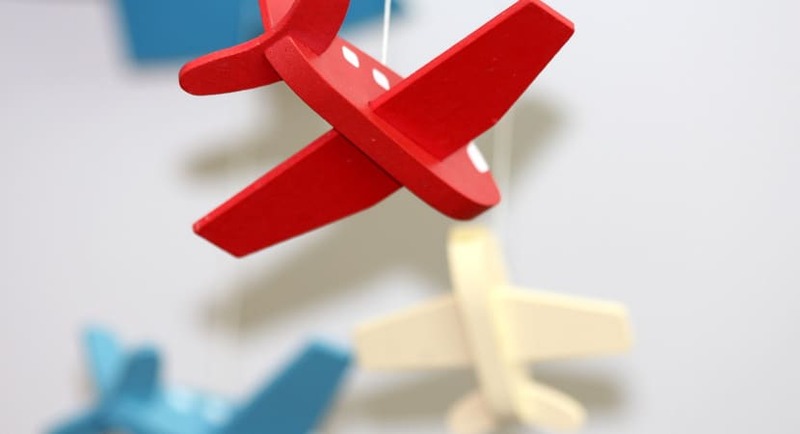 The apps, widgets, and notification are in a very categorized manner which makes it easy to access. Also, the information is in a drop-down menus which makes the desktop clutter-free. One of the best themes for the black and white lovers. It is with a simple design and loads of black and white skins to choose. 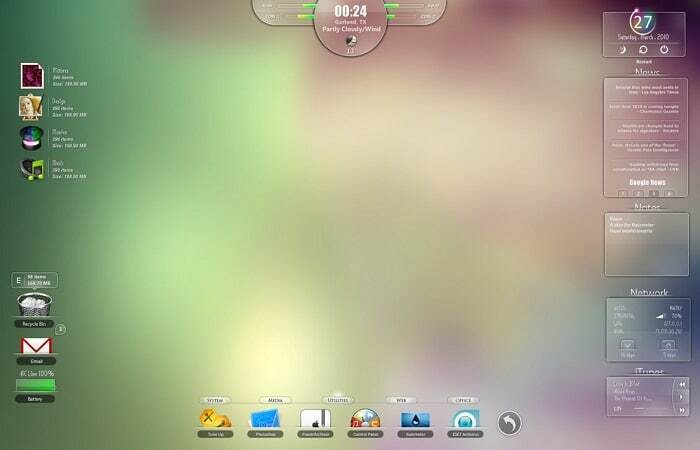 It also allows customization of the placement of the widgets and the information displayed by each of them. 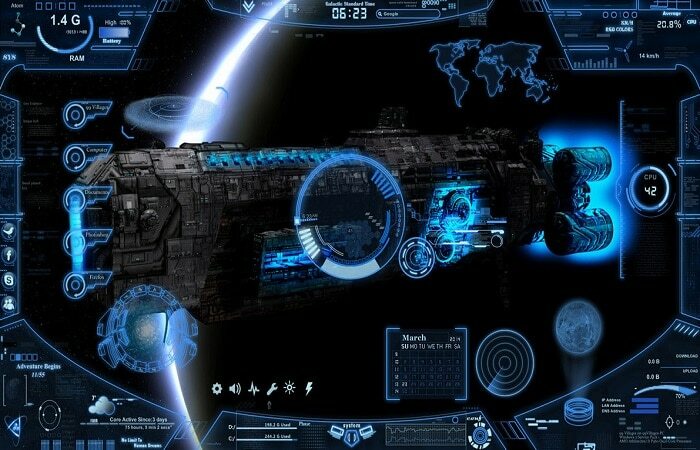 As evident from the name, this Space RainMeter theme is modeled to provide space and space travel related effects. The background of this skin is a super quality image. 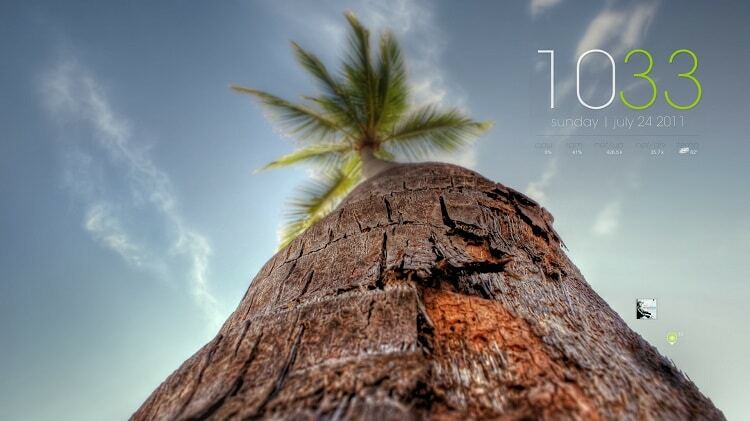 Which when coupled with the numerous widgets and features makes this an excellent skin. Especially for the space-lovers to use. 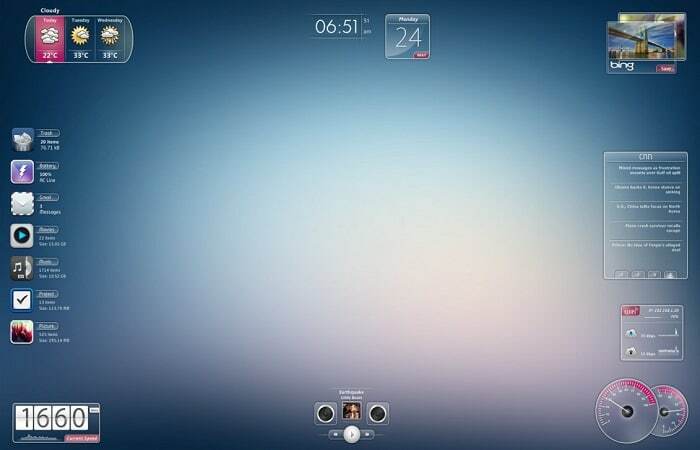 The characteristics of this skin also include eight skins and three audio visualizers. An upgrade on the older skin- Elegance, this new version is a more elaborate and better-looking version; Hence, Elegance 2. If you are looking for simplicity, this is a right choice for you because of the simple, graceful style..
For customization of Elegance 2, a color changer tool that you can use to change the color in one click. Although fully packed on the widgets and features list, Wisp is another of those RainMeter skins whose visuals entirely depends on the type of background the user decide to pair with it. Another skin for the dark theme lovers. 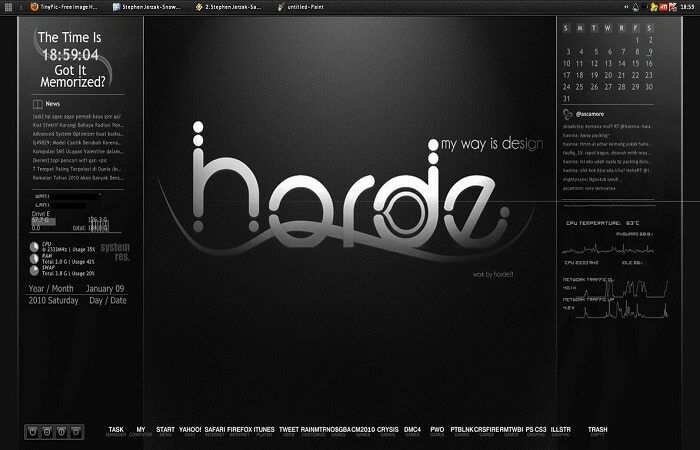 Horde has solid color dark background with minimal effects giving it a serious look. 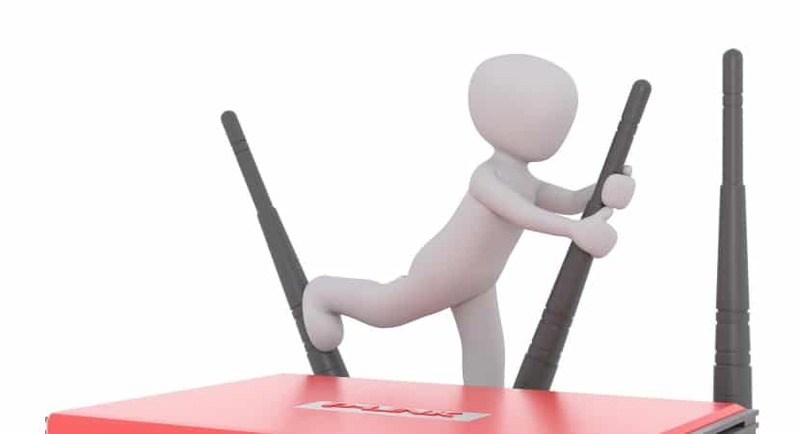 Features like Enigma taskbar, Enigma Calendar, Enigma network line and network address are present there. Not to mention, RSS Readers, Kingdom hearts memorized Clock, Power Toy, and a HUD. Obsidian is a one of the best & user-friendly RainMeter Skins. It looks like an architectural model. Where all the icons, widgets and shortcuts are available in a block like an arrangement. 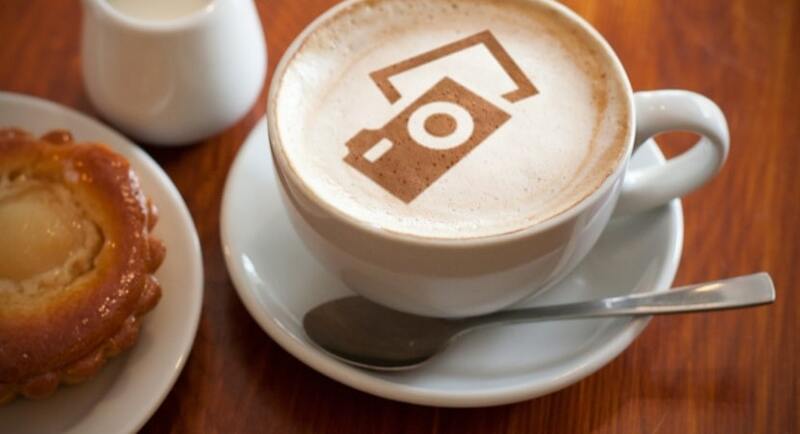 Although simple, it can be very efficient to use due to its icon arrangement and looks good too. This skin is designed in the backdrop of an epic (but imaginary) image. It gives terrific visual experience. 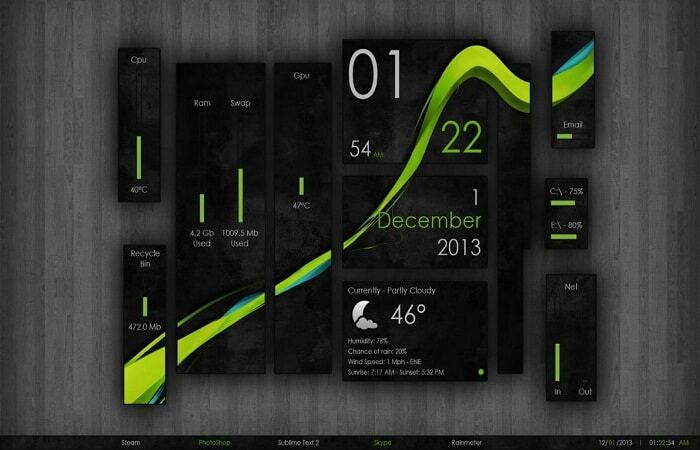 You will also get all the standard RainMeter widgets like Date and Time, PC usage, RSS feed, notifications, etc. An all green based theme for Windows 10. 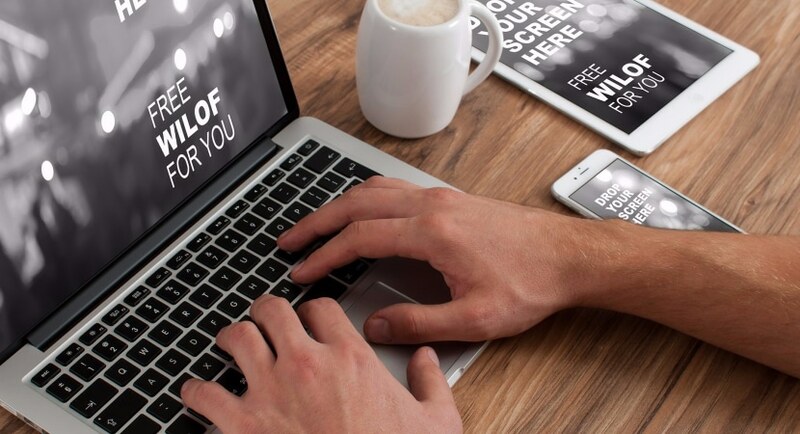 Adian Bolon Aero skin is highly customizable and allows you to access all your required applications in a single click. Another skin for the simplicity lovers. 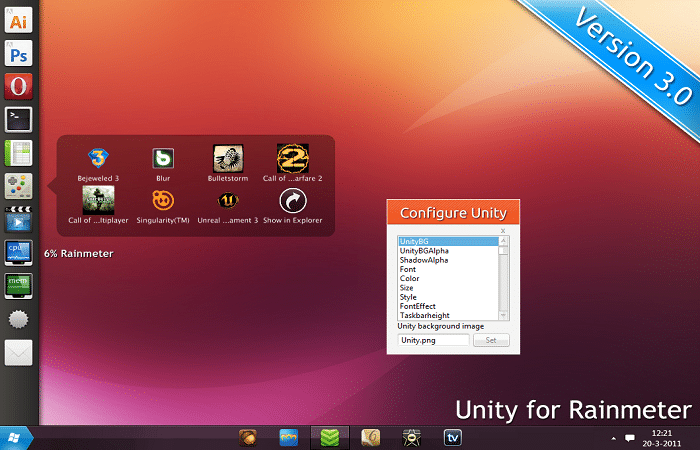 Unity features all the standard widgets and features of RainMeter skins. 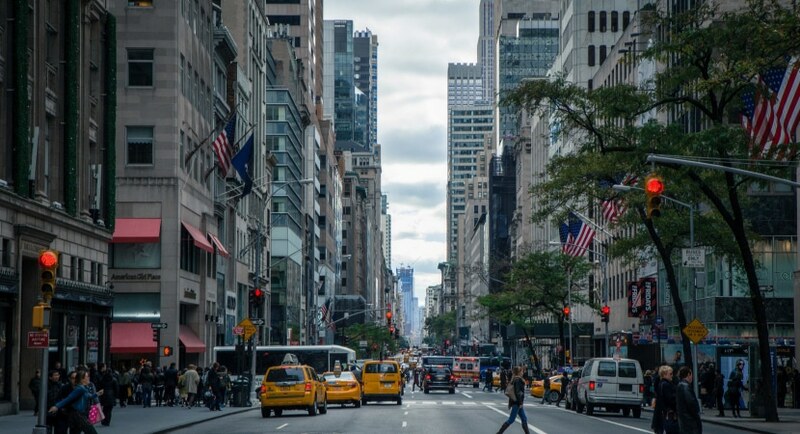 It is present immaculately and straightforwardly. I love how you have given photos with each Rainmeter theme, makes my search even easy. Hi there ! I think that the best skin would be of Jarvis. Guilty fan of Iron Man.